Admire the elaborate details of Franciscan Church (Franciskanska cerkev), known for its high-Baroque exterior and the distinctive pinkish color of its outside walls. Dominating the square on the left bank of the Ljubljanica River, the church was built by Augustinian priests between 1646 and 1660, but Franciscans painted it red when they took over in the 18th century. The three sets of stairs lead to the main entrance with a copper statue of the Madonna with Child standing at the top of the gable. Notice the onion-shaped spires topping the bell towers by the presbytery. The original 19th-century wall paintings were damaged by the 1895 earthquake and the new frescoes were painted in 1930s. Don't miss the highlight of the interior: the Baroque main altar carved by Francesco Robba in 1738. 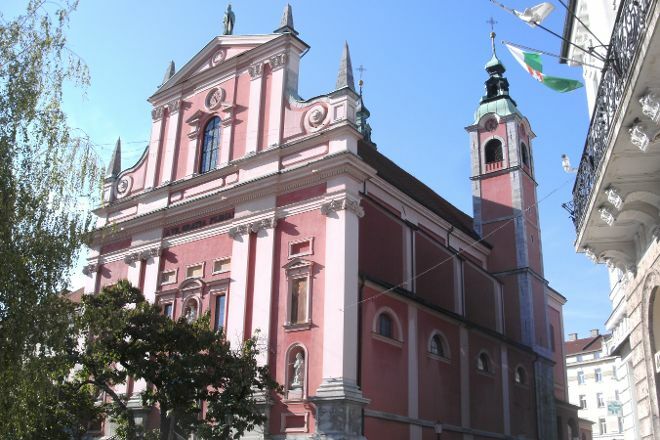 Make Franciscan Church (Franciskanska cerkev) a part of your Ljubljana vacation plans using our Ljubljana online route planner . Overlooks the square, with its Baroque façade of unusual red/orange and is a Franciscan church dedicated to Saint Mary of the Annunciation. A staircase leads inside, that is well cared for and with frescoes all over the place. Surveying a sculpture of the Pietà on the left side. Every day, we help thousands of travelers plan great vacations. Here are some tips on how to use your Listing Page to attract more travelers to your business - Franciscan Church (Franciskanska cerkev). 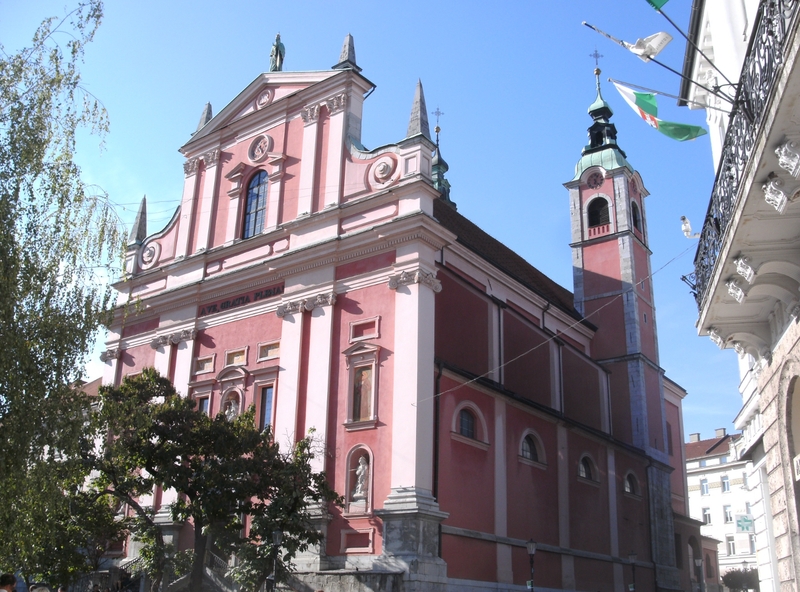 Promote your permanent link - https://www.inspirock.com/slovenia/ljubljana/franciscan-church-franciskanska-cerkev-a110501491 - on your website, your blog, and social media. When a traveler builds a plan from this page, the itinerary automatically includes Franciscan Church (Franciskanska cerkev). This is a great way for travelers looking for a great vacation in your city or country to also experience Franciscan Church (Franciskanska cerkev). Promoting your link also lets your audience know that you are featured on a rapidly growing travel site. In addition, the more this page is used, the more we will promote Franciscan Church (Franciskanska cerkev) to other Inspirock users. For best results, use the customized Trip Planning Widget for Franciscan Church (Franciskanska cerkev) on your website. It has all the advantages mentioned above, plus users to your site can conveniently access it directly on your site. Visitors to your site will appreciate you offering them help with planning their vacation. Setting this up takes just a few minutes - Click here for instructions.